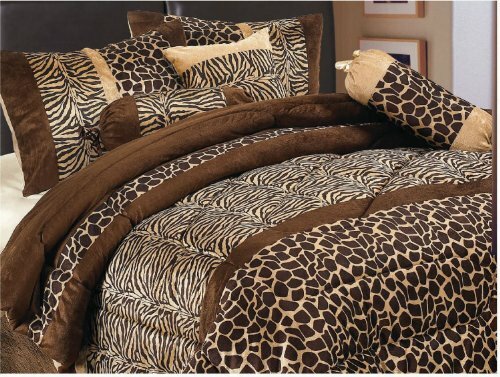 Bring a touch of class into your Bedroom with this 7 Piece Animal Print Decor Bedding Set. This bed in a bag set will add a touch of warmth and it will create a calm and relaxed atmosphere for your bedroom. Comforter sets are designed to keep you updated and fashionable in the most convenient and inexpensive way. Our comforter sets are a tremendous blend of bold and vibrant colors. They can transform a room from bleak to bright and cheery in a matter of minutes. Our comforter set will have your bedroom decorated with style. Turn your home into a haven with our beautiful comforter collection. Our comforters come in many sizes, including king comforters, queen comforters, and even California King comforter sets. We've included everything you need to make over your bedroom such as comforter, pillow shams, and bed skirts. Comforter sets are comfortable, durable and beautiful. Our comforter sets are designed for year around comfort. Bring elegant style to your bedroom with this cool comforter set with inviting Animal Prints. If you have any questions about this product by GrandLinen, contact us by completing and submitting the form below. If you are looking for a specif part number, please include it with your message.